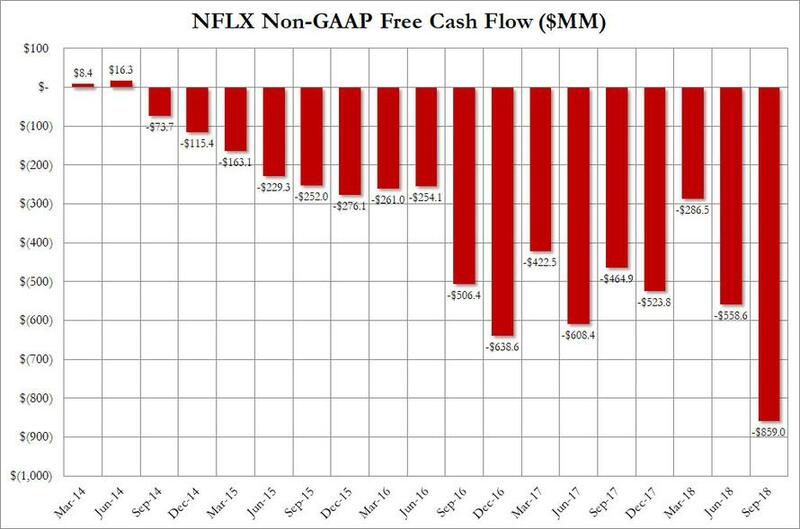 Just six months after Netflix added $1.9 billion in Ba3/BB- rated junk bonds (upsized from an initial offering of $1.5 billion) to its balance sheet to fund its ravenous cash burn global expansion, moments ago - and just one week after reporting a whopping 7 million new subscribers in Q3 and projecting a record 9.4 million subs in Q4 - the video streaming company announced it intends to offer another $2.0 billion of junk bonds in the form of US-dollar and euro denominated senior unsecured notes in two series. Terms of the deal were not announced and will be determined by negotiations between Netflix and the initial purchasers according to the press release, which also notes that Netflix will use the net proceeds from this offering "for general corporate purposes, which may include content acquisitions, production and development, capital expenditures, investments, working capital and potential acquisitions and strategic transactions." Translation: Netflix will continue spending millions to acquire subs and keep its recent trend of record subscriber growth. The new junk bond issue, which will likely end up being upsized to $2.5 billion, will push Netflix' total debt load above the current $8.4 billion to at least $10.5 billion and likely more. According to S&P, Netflix' adjusted leverage will rise to 4.8x by year end: a number that is dangerously high for a "growth company." 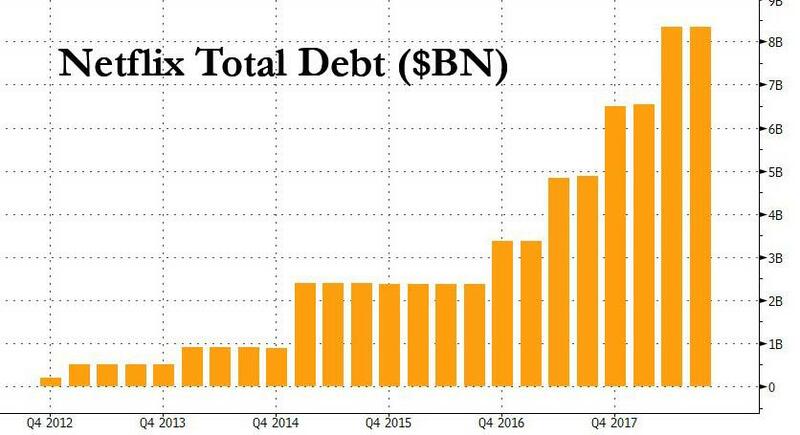 As a reminder, this total debt number excludes the roughly $18 billion in off-balance sheet content obligations carried by Netflix. ... it will fund the company's relentless cash burn for at most two quarter before Netflix is forced to raise capital once again: just last week, the company said that it expects to burn about $3 billion in cash this year as it continues to prioritize original series and movies. With its stock valued at $145 billion, Netflix often touts its "thick" equity cushion as reason to support its debt. It's historically borrowed to invest in original content and plans to continue to do so, the company told shareholders last week. Meanwhile, as long as yield-starved junk bond issuers are happy to reward cash burning companies with even more debt - and they will as a result of the ongoing decline in primary junk bond issuance - expect this trend to continue. The only question is what the coupon on the latest batch of NFLX bonds will be: as a reminder, the April $1.9BN issue carried a coupon of 5.875%. With rates rising notably since then, Netflix may have no choice but to offer a coupon approaching 7% to keep funding its relentless cash burn global expansion.